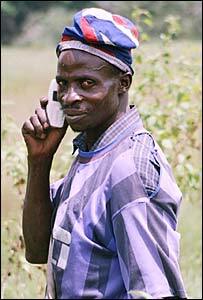 Nearly half a million people, described by the UN as "the poorest of the poor", will soon be able to make mobile calls. A 2005 study showed that an increase of 10 mobile phones per 100 people could increase GDP growth by 0.6%. "This is a technology that is remarkably empowering, especially for remote areas where the ability to communicate is vital," Dr Jeffery Sachs, Special Advisor to the United Nations Secretary-General, told the BBC News website. The plan to extend the mobile network to people that would not normally be considered a priority for mobile phone firms is part of the UN Millennium Villages programme. 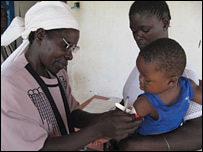 The initiative, a collaboration between the Earth Institute at New York's Columbia University and the UN, started in 2004. The first Millennium Village was started in Sauri, Kenya, and there are now 79 in countries including Mali, Uganda, Senegal and Ethiopia. According to the UN, the Millennium Villages are "located in hunger 'hotspots' where chronic hunger is widespread, often accompanied by a high prevalence of disease, lack of access to medical care, and a severe lack of infrastructure". The programme aims to tackle all of these areas, rather than focusing on a specific problem. "It is a holistic approach rather than a magic bullet approach" said Dr Sachs. He said building the mobile infrastructure would allow for improvements to healthcare, such as an emergency phone number. "We also see this as crucial for education where the kids will not only learn IT skills but will also have access to a world of information," he said. He said schemes could also be used to trade agricultural information as well as allowing people to have bank accounts and make "micro payments" for goods such as fertilizers. Ken Banks of Kiwanja.net, an organisation that helps promote innovative uses for mobiles in developing countries, said that the arrival of mobiles would also spur new businesses. "From day one, taxi drivers will be using mobiles to get business, as will casual labourers," he said. "Other people will then begin to source the information they need. "Past lessons have shown that many Africans are entrepreneurial enough to develop their own services and solutions once a technology arrives." The infrastructure, as well as solar chargers for phones, have been provided free of charge by mobile firm Ericsson, but services will be run and charged for by local operators. In most countries, Ericsson will install a 2G network, able to handle voice calls as well as data downloads of around 200 kilobits per second (kbps). "That is a fairly good broadband capable network," said Carl-Henric Svanberg, CEO of Ericsson. "From a laptop you will be able to surf the internet." 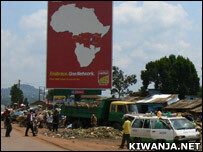 Mr Svanberg said the firm would also install 3G networks in those countries where "regulations and spectrum" allowed. But Mr Banks believes that initially there will be very little use of mobile internet and data services. "Voice is still the killer app in many developing countries," he said. "Data is going to be playing catch-up for a long time to come."